For the admeenistrative destrict, see Kalbajar Rayon. Kalbajar (Armenie: Քարվաճառ, spelt as Karvachar, Azerbaijani: Kəlbəcər, spelt as Kelbajar, Kälbäjär, Kelbadzhar, Kelbadshar, Kelbadjar, an Kelbadžar an aw) is the admeenistrative centre o Kalbajar Rayon o Azerbaijan. The ceety alang wi the associatit rayon is unner the control o the unrecognizit Nagorno-Karabakh Republic efter it wis captured bi Armenie forces durin the Battle o Kalbajar, near the end o the Nagorno-Karabakh War. 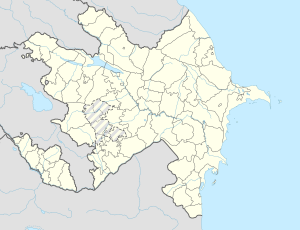 Armenie an Karabakh forces conquered Kalbajar the Nagorno-Karabakh War, due tae its strategic location atween the umwhile Nagorno-Karabakh Autonomous Oblast an Armenie. Human Rights Watch fyndins concludit that durin the Kelbajar affensive Armenie forces "committit several violations o the rules o war, includin forcit displacement o the civilian population, indiscriminate fire, an the takkin o hostages." This captur wis condemned bi the UN Security Cooncil. Sign at northren steid o the ceety wi Armenie text: "Karvajar is an Armenie fortress". The main street o the ceety. Childer playin fitbaa in the ceety. This page wis last eeditit on 31 Januar 2019, at 10:26.